When the Space Shuttle hit the Earth's atmosphere on its return trip from the cosmos, it was traveling at 17,000 miles per hour—25 times the speed of sound. Were it not for the protection of the ceramic tiles that acted as heat shields, the entire spacecraft would have burned to nothing. And those are exactly the kinds of the conditions UC Santa Barbara scientist Tresa Pollock often has in mind as she seeks to discover new and better materials. Now, Pollock, chair of the materials department at UCSB, has received one of 13 prestigious 2017 Vannevar Bush Faculty Fellowships from the U.S. Department of Defense (DoD). The award includes $3 million to fund five years of Pollock's research, which is aimed at developing a 3-D platform for discovering new materials capable of operating in extreme environments such as those experienced by rockets, aircraft engines and hypersonic flight vehicles. The fellowship program provides awards to top-tier scientists from U.S. universities to conduct revolutionary "high risk, high pay-off" research that addresses the "hard" problems that DoD needs to solve. "I am very honored to be selected for this award, which is named after a visionary scientist who shaped the U.S. research infrastructure," Pollock said. "I am also grateful for the research support this provides and for the support the DoD has provided for many of my previous research efforts. The Vannevar Bush Fellowship will allow us to pursue research in directions not possible with other types of research programs." Said Rod Alferness, dean of UCSB's College of Engineering: "For Tresa Pollock to receive a prestigious Vannever Bush Award from the U.S. Department of Defense is a tremendous and well-deserved honor. I have no doubt that the funding that comes with the fellowship will enable her and her team to develop breakthroughs in 3-D printing, nanoscale analysis and efficient production of important new materials." "Printing advanced materials into complex architectures on demand poses many technical challenges, and this fellowship will enable us to tackle what are currently limiting materials-science issues," Pollock said. "The award builds on our previous research on crystal growth and solidification, 3-D materials science and alloy design. These intellectually challenging areas of research are highly suited to the talented Ph.D. students at UCSB." In recent years, it has become possible to use both laser and electron beams to "print" engineering objects that have complex shapes. The process involves melting and fusing metallic powder particles—each about 10 times finer than a grain of beach sand—in millimeter-scale "pools" created by local focusing of a laser or electron beam. Drawing from the entire periodic table, it would be possible to mix and print millions of metallic powders having different combinations of elements. But until now, Pollock explained, it has been possible to print with only six or seven types of powders. Not enough was known, she said, about the complex series of events that occur during the melting, mixing and vaporization of the material that occur when the powder bed is scanned by a high-intensity beam, and afterward as the material cools. "The grand challenges for making materials in this fashion are twofold and three-dimensional," Pollock said. "We need to design material compositions in which defects will not form during melting and cooling within the cubic-millimeter pool, and we need 3-D tools to examine the structure of that millimeter-scale volume of material at the nanometer scale to ensure that the structure is sound. The Vannevar Bush fellowship will enable us to focus on these two aspects of the printing problem." 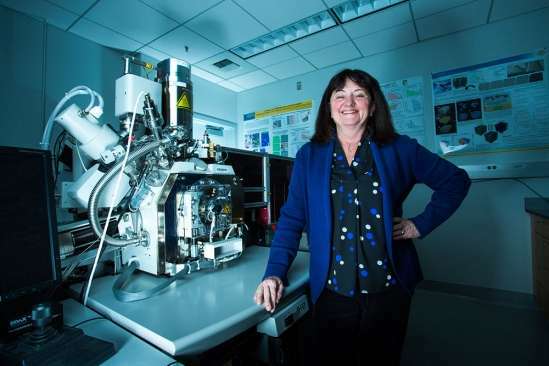 Building upon a combined laser and electron-beam tomography system she developed at UCSB, Pollock will design and integrate an additional open-source, highly automated laser-powder-processing platform that can be operated either in layer-by-layer additive build mode for a given material, or in combinatorial chemistry mode to vary chemistry locally. According to Pollock, the 3-D platform will enable exploration of previously inaccessible design spaces of higher-dimensional compositional materials and will also provide rapid acquisition of 3-D information about the materials' chemistry, structure and crystallography—from the nanometer-to-millimeter length scales critical in emerging approaches to additive manufacturing.